Touring by kayak gives you an intimate view of Dalmatia. The islands are small and close together, so paddling by kayak is an ideal way see a great deal in a single day. Kolocep: Cliffs and Caves begins with car transport to Zaton Bay, 10 km. north of Dubrovnik. Full-Day Tour: Daily 9:00 a.m.
Kayakers who venture to Koločep are rewarded with a sweeping vista of steep cliffs that rise abruptly from the sea, revealing dramatic wind-carved caves. Visit the island’s two small settlements, hike its shady walking trails, and fill your dry bag with homemade jams, dried herbs, candied fruits, and virgin olive oil purchased from a local family. Paddle to an unforgettable lunch at a charming seaside restaurant in one of the island’s small settlements. Highlights include snorkeling in Blue Cave, swimming in a secluded cove surrounded by towering cliffs, walking through pine forest and citrus groves, feasting on grilled sea bass or steamed mussels, and a visit to a family farm stand selling homemade Koločep products: olive oil, brandies, lavender packets and candied citrus fruits. The Koločep day tour has a flexible itinerary, easily adapted to accommodate groups and daily weather and sea conditions. The tour begins in the protected waters of Zaton Bay. A short version includes a crossing to one to the two small villages on the island, roughly 1 to 1.5 hours of paddling each way. The island's network of walking trails connects the two small villages as well as the inland sea side to the open sea side. 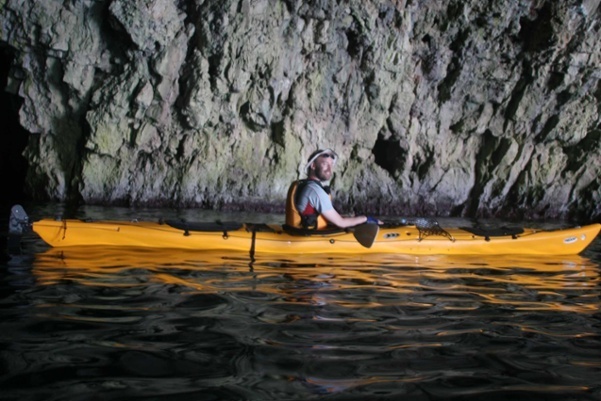 A slightly longer itinerary includes an additional paddle along towering cliffs to caves on the backside of the island, 1.5 to 2 hour of paddling in the morning and again in the afternoon. A crossing and full circumnavigation of Koločep Island is roughly five hours of kayaking: 2.5 hours in the morning and in the afternoon. Lunch, at a lovely seaside restaurant in a village on Koločep Island, is not included in the tour price. Bring a bottle of drinking water, sun protection (sunscreen hat, sunglasses), and money for lunch- we eat at a wonderful seaside restaurant in a small bay on the island. A towel and camera are optional. Wear a bathing suit with clothes over. AKT supplies all of your kayak and snorkeling gear, including aqua shoes for kayaking, swimming, and walking on the rocky shoreline. We supply dry bags for your personal items (wallet, camera, clothes, towel, and phone), which stay dry in your dry bag stored in your kayak bulkhead compartments while you are kayaking. These items are available while you are on the island. In cooler weather we supply waterproof paddle jackets. On Koločep you have time to swim, snorkel, hike, relax, and eat lunch. Reservations can be made for all day tours up to one day in advance at AKTʼs ofﬁce in Dubrovnik or at your hotel concierge or local tourist information center. Reservations may be made up to seven days in advance online. No deposit is required for reserving a day trip. Day tours can be combined into a 2-4 day custom tour packages. Please contact us for a consultation today.